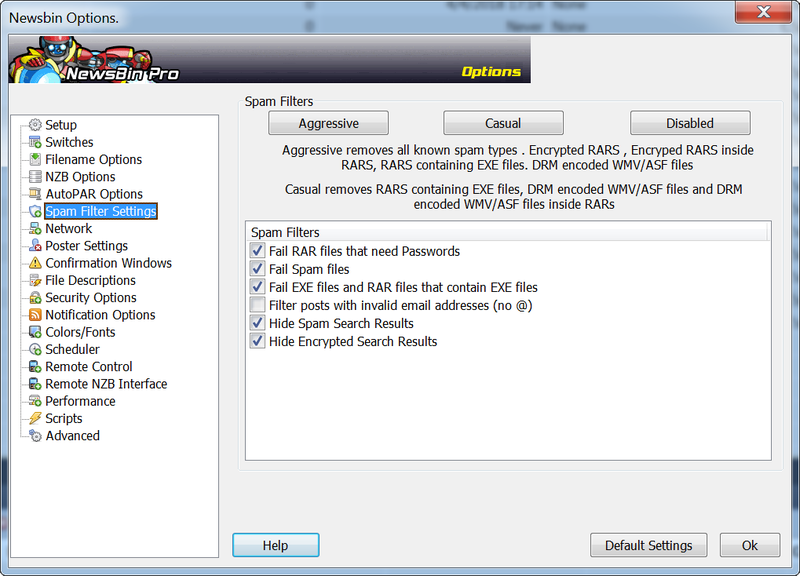 Newsbin Pro has support for a powerful spam filtering system. As you can probably imagine, not everything that you can read on Usenet is kosher. Popular newsgroups can provide access to anything from text discussions to pictures, multimedia, and video. This massive availability of data also means that you have to be careful that your downloads are what they claimed to be and not something malicious. Newsbin Pro has added spam filtering features that can auto-detect if a post is likely to be spam or even viruses. The newsreader can exclude suspect posts can include RAR files that are encrypted, password protected, and especially those that are hiding executable files inside them. When an executable is hidden inside a RAR archive, it is usually a trojan just waiting to make your computer part of a botnet or worse. Spam Filters is where you can set how aggressively Newsbin Pro will work to filter downloads that it suspects as being spam. You'll find settings for your network connections here, including settings for limiting the speed of downloads. This can be useful for some individuals that want to reduce the bandwidth usage of the Newsbin newsreader. Newsbin is able to create a blacklist of posters that you do not want to read, or want the news client to ignore. This is a popular anti-spam feature that can be the key to enjoying better browsing. Sometimes the newsreader software will ask for confirmation when a certain action is performed. The most obvious time that this happens is when you're exiting the program. It will ask you to click if you are really sure that you want to exit. If you're sick of it asking you such questions you can turn that off here. File descriptions save a description of a file after it has been downloaded, but these are rarely read. The description file is named “descript.ion”. If you have no use for this knowledge you can turn it off here. If you're interested in requiring a password at startup, you can create one in this window. You can also prevent the newsreader from being opened by other users. The security settings can prevent individuals from accessing Newsbin locally on your computer. This is most useful if your wife, girlfriend, or boss isn't quite fully aware of your account on Usenet Storm. Newsbin can be setup to notify you under most circumstances. If for some reason, you want it to send you an email after a file has been UnRARed, you can do that here. You can customize the newsreader software to display things a certain way. Changing fonts and color settings can be especially helpful for users that might be colorblind. When Newsbin is set to download files from your news server automatically, the scheduler can inhibit how many system resources or how much bandwidth the program uses during certain periods of the day. For instance, if you want the software to wait until the wee hours of the morning to download a host of NZB's from your news server, it is easy to set that here. One of the cooler settings that Newsbin Pro offers is the ability to setup the software for remote access. Here you can add a password and port for the client to listen on as a server. For those that are interested in integrating the Newsbin client with SickBeard or other external NZB software, this is where the basic setup is. Basically, this allows you to grab NZB's and download them the moment they become available on Usenet. It's a nifty tool that allows for easy automation of your news client. The service will support NZB files that are read in from 3rd party software, and will work on the data automatically. Every version of the news client includes added support for these connections. After a file has finished unpacking, Newsbin can support executing a batch file. This could be useful for moving certain kinds of files around, automatically converting from one file type to another, or deleting files that are otherwise unwanted. Setup options that don't fall neatly into any of the aforementioned categories are generally put under Advanced. Some of them actually are advanced. Others are really not very advanced. If you didn’t find what you were looking for anywhere else, you can always try to see if it’s under this section. You'll notice that Newsbin has support for a lot of options. 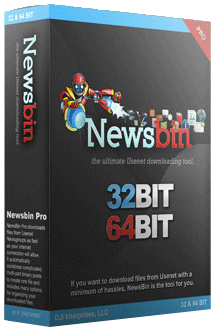 For those that are just getting the hang of Usenet, Newsbin is a bit of a cluster-jam. After a while, you'll get used to the layout of the windows, but for users that are seeing it for the first time, it can be quite intimidating. That's largely due to the fact that the software employs a freeware library of icon-buttons. While useful, these buttons are for convenience and largely redundant. Eventually, they'll become your new best friends. If you hover over them for a second, they will explain to you what they do. But there's nothing you can do with these icons that you cannot also do from the drop-down menu above them. They are just there for easy access. So do not be alarmed! A freshly loaded Newsbin will display the Search Tab. The next tab over will be the Groups List tab. These are both excellent tabs to acquaint yourself with. You'll also notice that when you select a group from the list, Newsbin Pro will add a new tab. The tab architecture allows you to have multiple searches and multiple windows open simultaneously. The nice thing about Newsbin is that it's very configurable in terms of layout. A lot of work has been put into making the GUI for Newsbin Pro as adaptable as possible. Each of the windows can be undocked and moved around. They can also be maximized, so if you want the news client to show more posts in the group, and less information about what it is downloading from the news server, you can create that setup in the client. Here, we'll go through some of the different setup options and how to navigate Newsbin Pro effectively. Newsbin Pro's right-click menus are remarkably useful. They support a different set of options depending on which window you're in. For instance, if you're in a tab that is displaying the contents of a group, you'll have different options to click for downloading a file, marking the post, seeing the contents of the post, and even replying to the post if you are so inclined. There are also special options for downloading such as having the system create a new folder for files or having the program download files to a folder that is named after the post. Each of these is useful, depending on what data you're going to download. If you look in the Downloads window, you'll find a different set of options for the right-click menu. Here you can pause a download, set its priority, remove it from the download list, and more. The right-click menu is also useful for updating, removing, or categorizing news groups. We're going to take a quick walkthrough of what you can setup under each of these options. The File Menu has support for 5 basic options, one of which is Exit. Newsbin also allows you to save your current configuration, or save your current configuration as a backup before you modify it. If you choose to save your current configuration under a different filename, you will need to rename it manually as Newsbin.nbi when you want to switch back to your saved settings. In addition, it is here that you can load NZB's. If you want to use the software as an NZB downloader, you can do that (see Downloading with NZB's on Newsbin). Newsbin will open the NZB in a separate tab. You simply select all the files from the NZB and then download them. You can have them downloaded to a folder that is named after the NZB by choosing Download To Folder Named For Subject, which is a very popular option to setup. Newsbin Pro uses watchlists to be on the lookout for specific terms. These can be found either locally within headers or throughout Usenet using Newsbin's global search option. It bears mentioning here that the global search option is not free and must be paid for. A typical registration costs $20, but if you want to add the global search functionality, that will cost extra. You'll have to refer to Newsbin's website for further details. Watchlists can be very useful for those that want to setup Newsbin Pro to automatically download based on a phrase. You can create as many watchlists as you want. It does, however, work better with the global function. If you're observant, you'll notice that the options listed under posts are the very same as in the right-click menu, simply less conveniently located. You can also clear your newsreader's history as well as reset your odometer. The odometer keeps a tally of how much you've downloaded, so if you're on a monthly plan, a debited plan, or a plan with a monthly limit, you'll know how many gigs of downloads you have left. Since we've already covered Settings in Newsbin Pro, we'll discuss making connections to News Servers next.